The NV Microlaser delivers the full power and capabilities of much larger desktop soft-tissue lasers in a pen-sized package. Weighing only 1.9 ounces and completely self-contained, the laser’s innovative, all-in-one, wire-free handheld design gives you unprecedented freedom in the office and operatory. Experience all the benefits of soft-tissue laser technology without any additional clutter or cords. Experience NV Microlaser. One laser certification is also included at no additional cost. 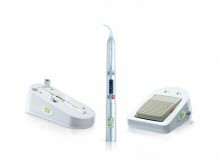 Click the button below to add the DenMat NV Microlaser Hand-held Dental Diode Laser to your wish list.